"Sight is one of your most precious senses, so it's only natural to want the best for your eyes." 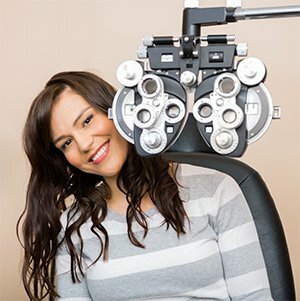 The role of an optometrist has changed over many decades and continues to do so. Not all eye examinations are the same, and our consultations involve much more than just the prescribing of spectacles or the fitting of contact lenses. Most of our optometrists are therapeutically endorsed, legally permitted to write prescriptions for eye drops, giving surety that your eyes are in safe hands for their vision and health needs. Our number one priority is you the patient. We are 'service oriented' not 'volume oriented' and our optometrists will explain your eye conditions in detail, all your treatment options and answer any questions you may have. It's first class eye-care with a friendly face. At Collins Street Optometrists, we take very seriously our vital role in the early detection of eye conditions and diseases such as changes to vision, cataract, glaucoma, and macular degeneration. We use state-of-the-art equipment and focus on providing you with high quality optometric expertise and advice on eyecare to preserve and best enhance your vision. Our comprehensive eye examination includes photographing the front and/or the back of the eye with our anterior slit-lamp camera and with digital retinal photography respectively. Beyond that, it also includes important screening scans by an Optical Coherence Tomographer; this represents advanced clinical optometric technology and allows us to view and quantify every layer of your retina in cross-section and in three dimensions to the micrometre. Such cutting edge technologies enable us to detect eye conditions at the earliest possible opportunity; this is all directed to achieving a better outcome for you, the patient. So whatever your concern, be it glaucoma, macular degeneration, cataract or otherwise, you can be assured you will be well looked after. Registration - here our staff will check personal details that will enable us to best look after you. Comprehensive history taking - conducting a proper case history is central to understanding your vision needs, and this can only be achieved by taking the time to listen and discuss your issues with you. Assessment of vision and your prescription - clearly an essential and basic part of your eye examination, and again this needs to be performed without undue haste to ensure your prescription is accurately determined. Reviewing your existing eyewear (if any) and, in light of the vision and prescription results, determining after further discussion with you whether or not new eyewear is required. As part of determining your eyewear needs, discussing the circumstances where you need to wear prescription lenses and whether some activities need specific eyewear. Most importantly, reviewing the health of your eyes both inside and out, to detect diseases such as cataract, glaucoma, macular degeneration and retinal disease related to systemic conditions such as diabetes and hypertension. Also of increasing relevance are screening procedures for ocular surface and dry eye disease - if left undiagnosed and untreated these can develop unnoticed over a period of years so that when debilitating symptoms appear these diseases are well advanced and far more difficult to address. Ocular Coherence Tomography (OCT), which enables us to not only view the retina in three dimensions, but also view the individual layers within the retina. This highly sophisticated piece of equipment represents the latest in diagnostic technology and is invaluable in the detection and analysis of glaucoma, macular degeneration and diabetic eye disease. The OCT has a number of different types of scans and analyses; a glaucoma screening scan is conducted on all new patients and more detailed scans are conducted on indication for patients at greater risk of developing these sight-threatening diseases. Looking for change is also particularly important in early diagnosis, and this is a function for which the OCT is ideally suited, as it provides a permanent baseline record for comparison. Digital retinal photography, which provides a two-dimensional colour image of the retina, the film at the back of the eye. Whenever OCT is performed a retinal photograph is also taken as standard procedure. Retinal photography provides a different view to the OCT and therefore shows some abnormalities that the OCT does not. If necessary, our Medmont C300 corneal topographer may be used for an intial analysis of the tear film, in order to identify those patients most at risk of ocular surface and/or dry eye disease before they develop symptoms. The topographer is also used to identify patients with keratoconus or those who may be suited to orthokeratology treatment of myopia. Click here for a handout on our eye examinations in pdf format. Our consultation fees reflect the fact that the examination we provide is more than just a basic check of your vision and prescription. Collins Street Optometrists will continue to actively engage advances in the detection, monitoring and management of eye disease, including glaucoma, cataract, macular degeneration and dry eye. We are also committed to providing continuity of care, so that you can see the same practitioner on an ongoing basis for many years. The fee for a comprehensive eye examination is $92.25, although if additional procedures need to be performed on that day there may be additional charges. Click here for more detailed explanations of our fees. At Collins Street Optometrists we offer our patients immediate reimbursement of their Medicare optometric benefits through our Medicare Easyclaim facility. For those with a health care card, our practice will continue to bulk-bill our consultations.